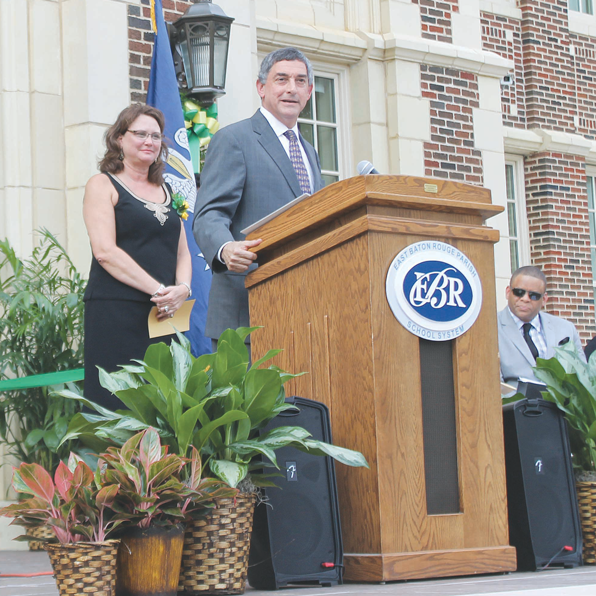 BATON ROUGE — The newly-restored and greatly-expanded Baton Rouge Magnet High School was formally dedicated in ceremonies Thursday, Aug. 23 on the steps in front of the historic school. The $58 million project is the hallmark of the East Baton Rouge Parish school system. Since becoming a magnet school in the 1970’s, the school has developed a national reputation for academic excellence. The school’s principal, Nanette McCann, was honored as National Principal of the Year by Supt. Bernard Taylor. Speakers included Lt. Gov. Jay Dardenne, Mayor-President Kip Holden, school board president Barbara Freiberg, and Supt. Taylor. John Pasterek of WBRZ-TV served as Master of Ceremonies. Many in the crowd were alumni who returned to the school to marvel at its return to glory.